On Tuesday, Feb. 23, the Samford String Quartet will perform music by Joel Scott Davis and Ludwig van Beethoven in Brock Recital Hall on the Samford University campus. The concert begins at 7:30 p.m. and is free of charge. One of the most challenging works in the string quartet literature follows. Beethoven’s String Quartet No. 15 in A minor, Op. 132, was composed in 1825, when the composer was in ill health. It is renowned for its slow movement, subtitled “Heiliger Dankgesang,” a holy song of thanks for a brief respite from his ailments. 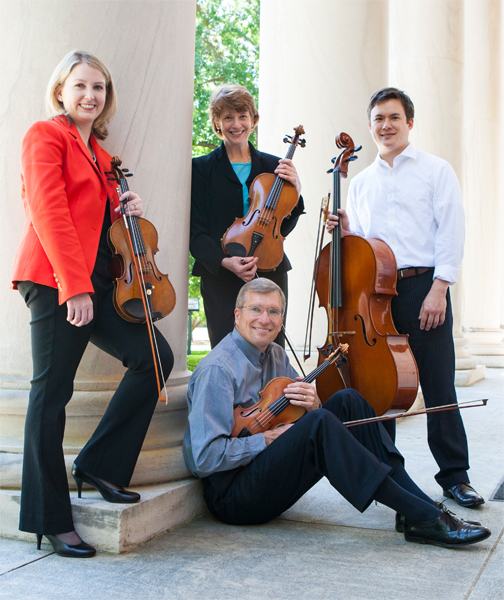 Formed in 2011, the quartet consists of Samford music faculty members who first played together in England and France. Since then, they have since performed for more than 2,500 school students in Tennessee, Indiana, South Carolina, Kentucky, Florida, Georgia and Alabama. The foursome consists of two married couples — Angela and Jeffrey Flaniken (viola and violin), and Caroline and Samuel Nordlund (violin and cello). Individually, the musicians have held several positions in symphony orchestras and play regularly at music festivals. Michael Huebner covers Samford Arts for the Division of Marketing and Communication.